Learn about our materials and why we are the best in the world. We have taken great care to ensure that the conservation quality materials that we use will help to preserve your document for a lifetime. When you receive your frame, you will see instructions on how to easily insert your diploma in your frame. The adhesive tape that we include in each frame to mount your diploma is Filmoplast P 90. 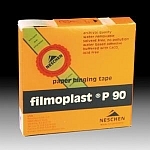 Filmoplast P 90 is made from a white, tear resistant paper and coated with age resistant acrylic adhesive. Both the adhesive and paper are buffered (pH 8.7 aged) so the tape remains acid-free for decades after application.